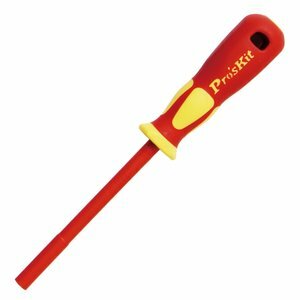 Pro'sKit SD-800-M4.0 is a VDE insulated nut driver for operation under up to 1000 V AC. Insulation is molded directly onto the blade and therefore guarantees safety when working on live equipment up to 1000 V AC. Ergonomic cushion grip handles for maximum comfort. Certified to IEC 60900:2004, VDE, and DIN 1000V safety standards; GS sign.